Today German Chancellor Angela Merkel and EU President Donald Tusk visited the Nizip refugee camp in south-east Turkey, not far from the Syrian border. The camp has been described as ‘perfect’. However, the two visiting dignatories were not allowed to visit some of the other refugee camps that the EU is funding for the ‘returns’ – the refugees who are being forced back to the war zones via Turkey as part of the EU-Turkey deal. That deal will see Turkey get 6 billion euros, visa-free roaming for all Turks and a promise of EU membership in five years time. What the media did not report today is how only a few days ago Turkish prime minister Ahmet Davutoğlu threatened to cancel the agreement unless the process for finalising the visa-free roaming is speeded up. Today, prior to the visit to Turkey by Merkel and Tusk, Amnesty International released a statement on what is really happening in Turkey (see below). “Merkel and Tusk should not confuse PR for reality. Abuses against refugees in Turkey are real and, what’s worse, [Merkel and Tusk] are complicit. Instead of focusing on whitewashing Turkey’s behaviour, and indeed stimulating it, Europe should focus on its own responsibility and start resettling a serious number of refugees from Turkey,” Gauri van Gulik, deputy Europe director for Amnesty International. An Amnesty International report was issued earlier this year, in February, and based on research conducted last October, November and December, including face-to-face and telephone interviews with more than 50 refugees and asylum-seekers who had been detained and with some who had been deported from Turkey, as well as with their relatives. AI researchers conducted interviews in Ankara, Bursa, Gaziantep, Hatay, Istanbul, Osmaniye and Şanlıurfa. The AL report provided evidence that showed how since September 2015 the Turkish authorities had been rounding up hundreds of refugees onto buses and transported them, in some cases more than 1,000 kilometres, to Project Fiche detention centres, where they had been held incommunicado. Some of the refugees reported to Amnesty how they had been shackled for days on end and beaten. One 40 year old Syrian man told how he had been confined to a room alone in the Erzurum Removal Centre for seven days with his hands and feet shackled. “When they put a chain over your hands and legs, you feel like a slave, like you are not a human being”. There were many other abuses. All of the detained refugees and asylum-seekers interviewed explained how they were first taken into custody in Turkey’s western border provinces, including Edirne and Muğla, before being driven to isolated outposts in south or east Turkey. Most of them had said how they had intended to cross the Aegean to the EU. 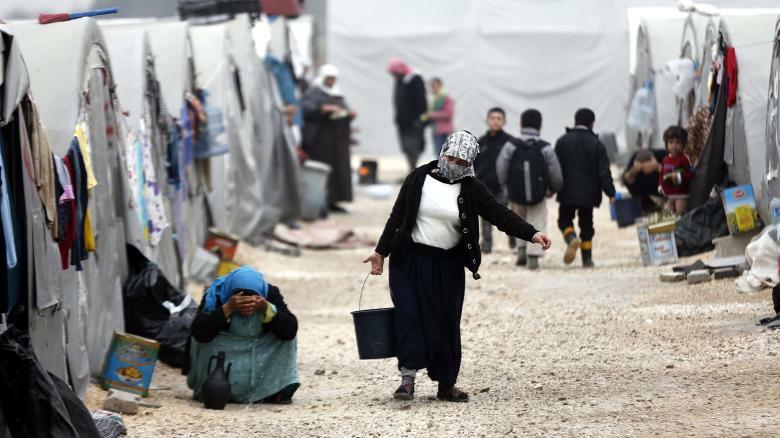 Many of the refugees detained were sent to a camp in Düziçi, in Osmaniye province, or to the Erzurum Removal Centre, in Erzurum province – some locked up for two months. Refugees in the Erzurum detention centre were able to show Amnesty International labels attached to beds and cupboards that advertised the centre’s funding under the EU pre-accession programme – the very programme that is planning to allow Turkey to join the EU. Indeed, EU officials in Ankara later confirmed to Amnesty International that the six EU-funded open reception centres in Turkey – the ones outlined in the Action Plan, Phase 2 – are the same detention centres that are being used to hold displaced persons prior to their being transported – ‘disappeared’ – to war zone countries. Many of those detained have subsequently been deported to Syria or Iraq after being pressured to sign documents in Turkish, which they did not understand. Both Turkish and international laws prohibit the deportation of people to a place where they would be at real risk of serious human rights violations. This principle – non-refoulement – can be breached in several ways, including directly through forcible returns to the country of origin, or indirectly when pressure is exerted on refugees to return to a place where their lives or freedoms are at risk–for instance through the threat of indefinite detention. According to Amnesty, the detention described by dozens of refugees and asylum-seekers was arbitrary, and therefore unlawful as per UN Human Rights Committee, General Comment no. 35, Article 9 (Liberty and Security of Persons). The EU is not only funding the detention centres (and turning a blind-eye to the abuses taking place in these centres) but via the NATO naval operations in the Aegean is also ‘supplying’ the inmates to those centres – inmates who eventually end up back in the very conflict areas from which they fled. The high-level European delegation travelling to Turkey on Saturday must address the catalogue of human rights abuses faced by refugees in the country, not sweep them under the carpet, said Amnesty International today. Chancellor Angela Merkel, along with European Council President Donald Tusk and European Commission Vice-President Frans Timmermans, will visit Gaziantep in southern Turkey. In the weeks since the EU-Turkey migration deal was signed, Amnesty International and other organizations have documented refugees being denied entry to Turkey at the Syrian border, being shot at by security forces and being forcibly returned to their country of origin. “There is no photo-op that can obscure the deep flaws in the EU-Turkey deal. What Angela Merkel really needs to bring back from Turkey are not smiling photos but cast-iron guarantees that the Turkish authorities will stop sending refugees back to their countries of origin and start implementing its asylum laws effectively,” said John Dalhuisen, Amnesty International’s Director for Europe and Central Asia. Testimony gathered by Amnesty International shows that Turkish authorities have been rounding up refugees who fled the Syrian war, including pregnant women and children, and sending hundreds of them back to the country – an illegal practice under Turkish and international law. Non-Syrian refugees have suffered similar fates. Turkey forcibly deported 30 Afghan nationals only hours after signing the EU-Turkey deal, despite the asylum seekers’ insistence that they would be attacked by the Taliban if returned. In recent months, the Turkish authorities have closed their borders to all but the most seriously injured Syrian refugees. Reports of Syrian refugees being shot at, and killed, while trying to cross the border irregularly have increased in recent weeks. UNHCR and non-governmental organizations are still being denied access by Turkish authorities to sites where refugees are being held, including those returned from Greece under the EU-Turkey migration deal. Inhibiting the access of independent agencies increases the risk of human rights abuses taking place in Turkish detention centres. Amnesty International has previously documented cases of refugees being held incommunicado within Turkey without access to any form of legal assistance or representation or communication with the external world. Independent monitoring is essential to ensuring refugees deported back to Turkey from Greece or travelling from Syria have all of their human rights respected. “EU leaders need a reality check. Turkey is not a safe country to return refugees to. European leaders must stop shirking their obligation to welcome refugees who are unable to find protection elsewhere. They must suspend the return of asylum-seekers to Turkey until the necessary conditions are obtained there. What EU countries can and should move on is the establishment of an ambitious resettlement scheme offering a safe and legal route for refugees in Turkey to reach Europe,” said John Dalhuisen. This entry was posted in Refugees and tagged Turkey. Bookmark the permalink.